At eight years old, Penelope Diamanti moved from Germany to Gabon. With a father in the Foreign Service, this kind of change was not unfamiliar. But it would turn out to be one of the most formative experiences of her life. Although they would move several times again before Penny returned to the United States, Gabon made a strong impression on her that pulled her back to the continent repeatedly and has kept her connected through beads. “It was huge market,” she tells me as we leave her Dupont Circle store for lunch and a talk. “Six to eight blocks long with two levels. The ground floor was mainly for tourists and the upper level for locals. I became familiar with both.” Although the market has changed in recent years after a fire, its atmosphere in Penny’s time as I imagine it was closer to that of downstairs Kramerbooks at peak brunch hours than it is to the quiet mezzanine where we sit for our interview. Many tourists are intimidated or overwhelmed by Treichville Market, but Penny came to know the place well. 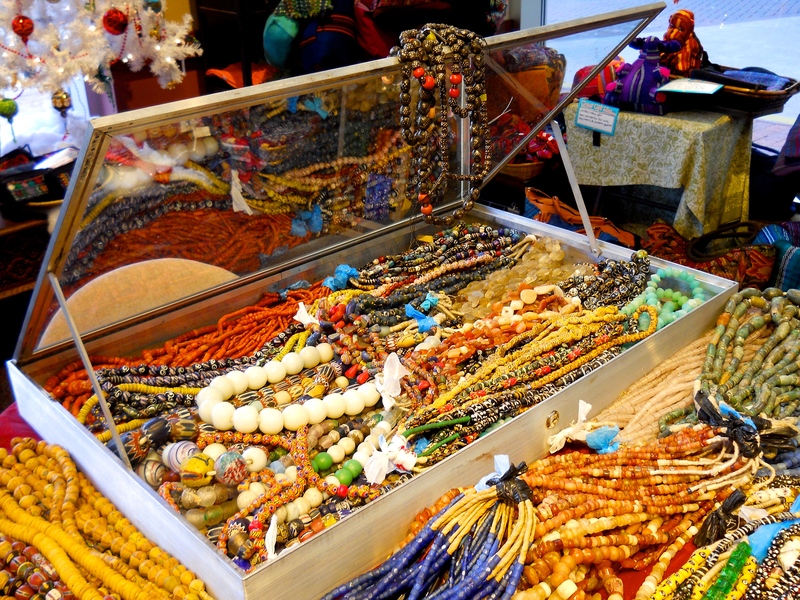 Her familiarity with its layout and its vendors made her a savvy shopper: she returned to the US with a small but impressive collection of beads. As Penny completed her MA in journalism she also continued making jewelry with her African beads. Her passion for the craft increased as her creations became more complex. Selling to friends and peers brought enthusiastic encouragement; her parents even started shipping her beads from Ivory Coast. Through the bead trader’s grapevine she become a link on the chain as African bead vendors just starting out in the U.S. found her. She helped them find buyers and was paid for her services in more beads. After college she moved to the East Coast to pursue a career in journalism while making jewelry on the side. Needless to say, things didn’t go as planned. Penny worked for the Library of Congress and then the National Geographic Society. “I expected to have to give up the bead business,” she confides, “but I couldn’t resist buying more beads! So I had to keep [making and] selling jewelry to support the habit.” At first she sold her beaded jewelry from her 1961 VW camper outside the Smithsonian’s Museum of Natural History. But eventually, violent threats from competing vendors drove her to a safer market, less profitable in the short term, but invaluable in the long run: museum stores. She started with the original Museum of African Art on Capitol Hill, and moved with the institution when it joined the Smithsonian. This put her work in gift shops all along the Mall, including those at the Sackler and the Natural History museum. Kathleen (pictured) and Penny recently held a trunk show at the Smithsonian’s National Museum of African Art. At this point Diamanti, Inc., as her company was known, really took off. Penny quit her day job and started making and selling jewelry full-time. Once every few months she would pack her bead trunks and travel to wholesale trade shows to sell to a wider audience. She built up a following of over 400 stores, galleries, and museum shops across the U.S. and even in Canada and Great Britain. But the constant travel, packing, unpacking, creating displays, selling for a few days, then packing up again soon grew exhausting. Finally she began to wonder if instead she could entice her customers into coming to her. In 1988 she began to plan her first store: the switch to retail, the location, the inventory. Stock came mainly from her personal collection. Long before the days of Kickstarter, to fixture the store in Dupont Circle, Penny raised funds with regular weekend bead sales held in her home. It was through one of these sales that Penny first met Kathleen Manning, who became one of her first employees and is now a co-owner of Beadazzled. When it came to dedicated and knowledgeable employees like Kathleen, Penny wanted, as always, to professionalize. Health insurance, benefits, and a fair scheduling system were essential. Her sister Pat became instrumental in the financial side of things, helping with bookkeeping, inventory and data management. Beadazzled began as, and remains, a family-focused business. Penny’s first store opened in Dupont Circle in 1989. When its first manager moved home to Baltimore in 1992, she launched a branch there too. Finally, a third location opened in Tysons Corner Virginia in `94 and moved to Falls Church in 2012. Today the Virginia and DC businesses continue to thrive; their employees communicate regularly with “headquarters” (located in Falls Church) and each other, maintaining a close-knit group that is both a business and a tiny community. Penny emphasizes that none of this came about with mere luck. Yes, luck and coincidence were part of her success– but the vast majority of it is due to hard work. Hard work, lifelong learning, and striving for professionalism. Investing in training for herself and her staff, ongoing community engagement, and responsiveness to changing trends has helped Beadazzled survive in Dupont Circle for 25 years. Now semi-retired (but still active in the international bead community, and on call to consult with Beadazzled), Penny spends most of her time the way she did all those years ago: making jewelry. This image of the “gem wall” at Beadazzled in Falls Church shows a similar arrangement to the one in Penny’s studio. I ask her how much time she spends, on average per day, making jewelry– expecting her to say two to four hours. She considers for a moment, then replies: “on a good day I spend ten or so hours in here. On a bad day, if I’m busy or the light isn’t too good, only about five hours.” With this response, her earlier statement that she has “more beads than [she] could use in lifetime” takes on new meaning. Looking around the room again I wonder how she possibly transported even a fraction of this collection to shows. She admits that it was difficult, even wearing, but continues with a thoughtful look. “Actually, though, beads are very portable. That’s where much of their value comes from. For many people– nomads and refugees– they’re the only portable thing of value. You put on your jewelry under your clothes and you run. It is this awareness of the ethnographic and historical side of beads that sets Beadazzled apart. In addition, Penny practiced fairness in trade before “fair trade” was even a buzzword; today she and other Beadazzled employees regularly travel to meet in person the artisans they buy from. Cutting out the middleman (someone who is often literally a man) ensures that the artisans (often women) get the credit and payment they deserve. It also gives Beadazzled a deeper understanding of its products, which they can then pass on to their customers. A woman myself, I comment on the fact that Beadazzled seems very female-driven on both sides. “Is that a self-selecting process?” I wonder. Financial independence, emotional expression; functional, decorative; business, art. Many would put “versus” between each of those pairs. But Penny uses “and.” Art and business are not opposed in the world she has created for herself, her employees, and her customers. Instead they are complementary. From the beginning, the Beadazzled slogan has been “where beads and inspiration meet.” So whenever customers make a purchase, they are enthusiastically encouraged to return and show the staff whatever they create with the materials Beadazzled provides, or to share their work online with the hashtag #BeadazzledCreations. In this way the cycle continues: inspiration, production, and fulfillment continue to thrive at every Beadazzled location. ← Guest Blogger: Rene Block and seed bead magic!